This afternoon I visited Harrods to try their Salad Kitchen. It’s located on the 4th floor where you’ll also find The Fashion Lab. 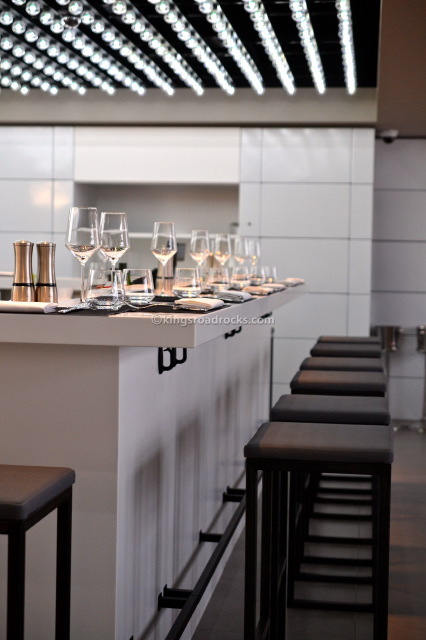 The restaurant’s contemporary design allows customers to either sit at the bar or at tables which line the walls. 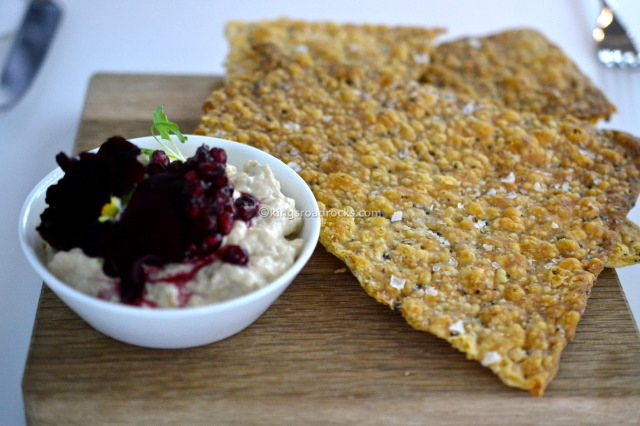 Whilst looking at the menu, we tried the baba ghanoush with homemade lavash. Baba ghanoush is an aubergine-based dip. 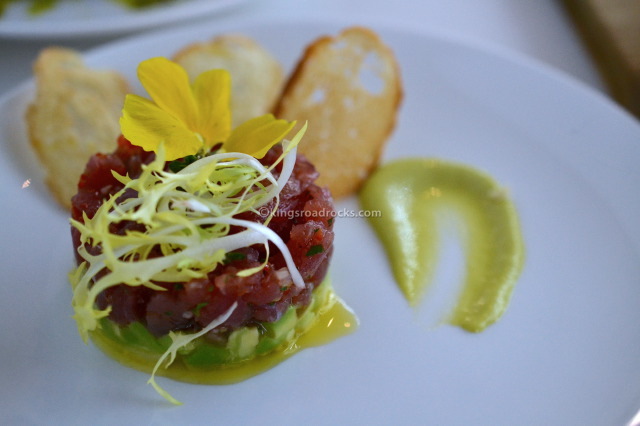 This one came topped with pomegranate which contributed to the already existing freshness of this nibble. The lavash is a seasoned bread, which I loved. 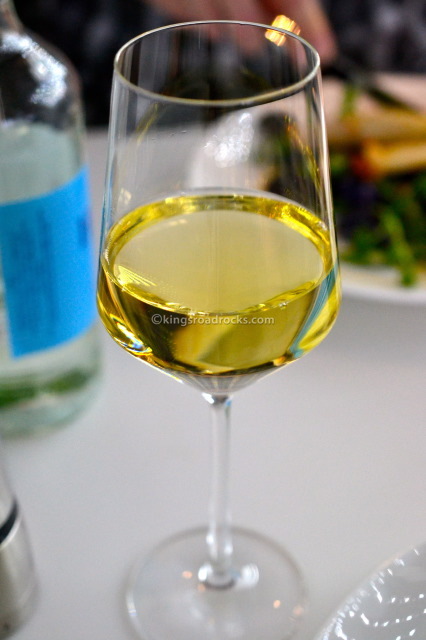 You can taste the cumin among other subtle flavours which work well with the dip. 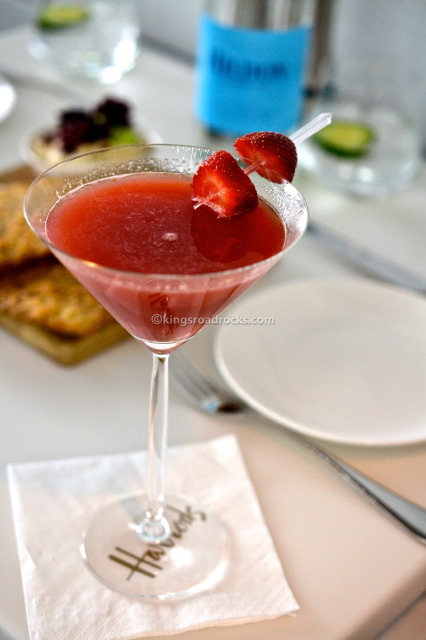 Along with the nibbles, the OH ordered a strawberry daiquiri which was amaaazing. 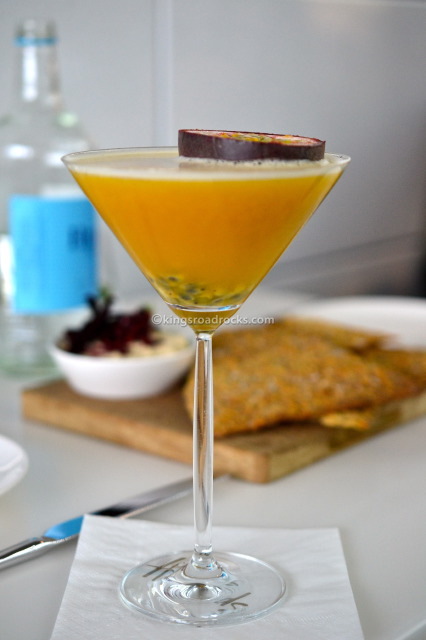 I had a passion fruit martini which was rich in both flavour and texture. It was faultless. … as well as the cauliflower and cumin fritters with cauliflower purée and salsa verde. I loved the wasabi touch along with the avocado. And the tuna? It was amazingly fresh – melt in your mouth fresh. 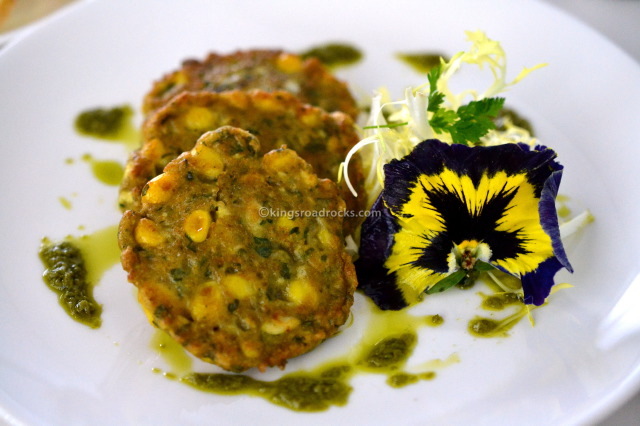 As for the cauliflower and cumin fritters, I relished the middle-eastern inspired flavours. 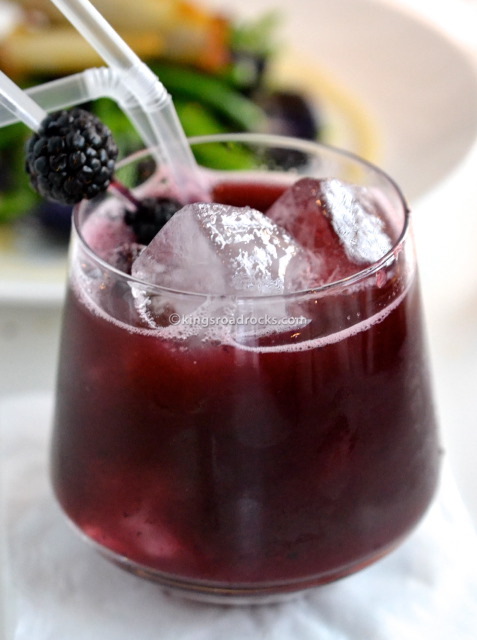 … whilst the OH ordered a Bramble cocktail, which included gin, crème de mure, blackberries, lemon and sugar. Call me naïve but I’d never thought about ordering a cocktail at Harrods before. I don’t know why. But today I discovered some great cocktail making, which I unreservedly recommend. 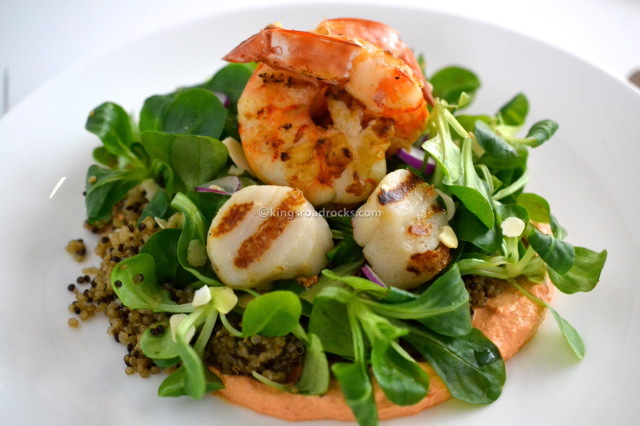 For my main I chose sea scallops and tiger prawns to go with a lamb’s lettuce salad with quinoa, radish, toasted almonds and roasted pepper yoghurt. 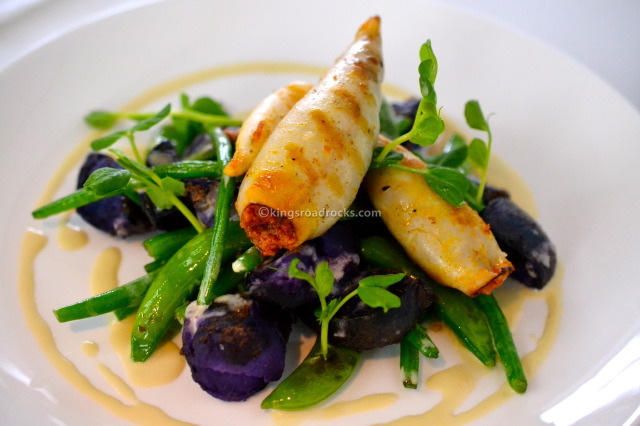 The OH ordered chorizo-stuffed baby squid to go with a purple potato, wax beans, sugar snap peas, tahini and lemon dressing. 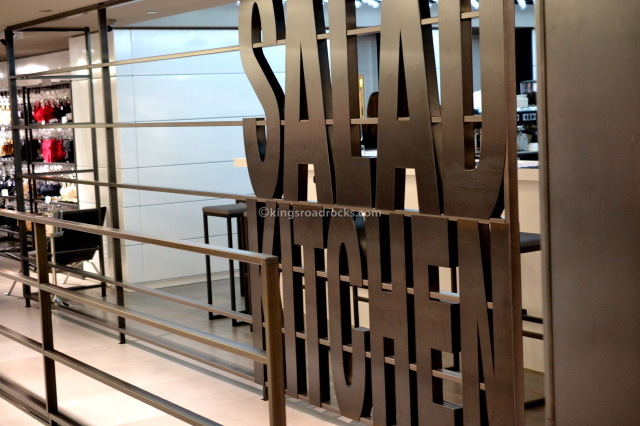 The way The Salad Kitchen’s menu works for mains is that you choose a dish from the robata grill and a salad, either cold or warm. The selection leaves you spoilt for choice but the puzzle of trying to find out what to pair with what is worth it. Both our choices were very delicious. For our final course, the OH and I decided to share a dessert. Or more like, I said no thank you but the wise waiter gave me some cutlery to try the trio of flourless chocolate desserts. 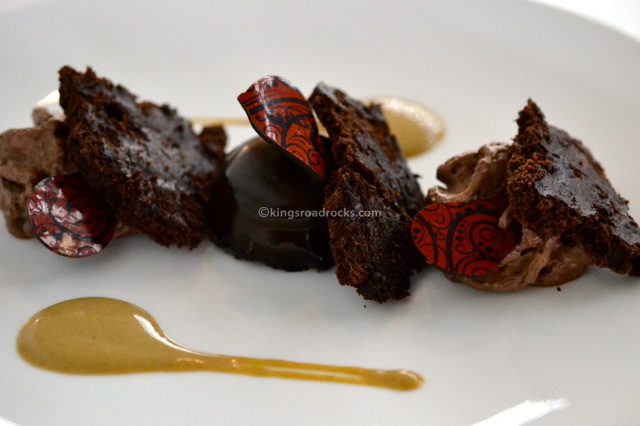 This involved three slices of flourless chocolate cake, mousse and in the centre a chocolate treat with a chocolate mint cake base. Yummmm! Disclaimer: Our lunch was complimentary for the purpose of the review but this did not affect my opinion on what we tried today. The food and drinks were fabulous.